Now you need to know one thing from that era of me using Open Trolley, Acma Mall didn’t give free shipping to Singapore. That post was in August 2009 and then they had the free shipping later. That includes the existence of Book Depository to us Singaporeans even if the about page says it had been founded in 2004. It was just then, no one here really used BD to tell us it isn’t dodgy and all that. OpenTrolley- order placed January 6th, available for pickup January 15th- 7 working days. Paid $0.50 to pick them up at Plaza Singapura. Acma Mall- order placed January 10th, delivered January 26th to my house- 12 working days. 40% off of best sellers and free shipping made this the best price, but the longest delivery. Book Depository- order placed January 17th, delivered January 26th to my house. Overall good prices and best delivery time (6 working days), even though they are not local. Will probably continue to use them in the future. I think both of the “local” bookstores are just a website who then order in bulk from overseas, thus the long lead times. Right. So there you go. It’s pretty much the same timeline for me too. I’ve ordered from OT, AM and lately BD. I ordered on the 12th July and got it on the 21st July which is pretty typical of a shipping time from the UK to here. Or at least whenever I bought items online, it usually comes around 10 days if it’s not in Singapore. What did I get? Red Hood’s Revenge by Jim C Hines! I got a little bookmark too! Let’s do a little packaging comparison with the 3 stores. Open Trolley – You can either pick it up from the Toy Outpost or get it delivered to you. If you’re picking it up, bring your own bag or else you’ll be carrying your book(s) just like that. If you get it delivered, they send it to you in a box! So pretty protected and all that. However, I ordered a somewhat large book so it wasn’t stuffed into my postbox but instead the postman came up to deliver the parcel and all that. Acma Mall – Deliveries only. Ditto on box. It’s more like a specialized book carton or something since it’s wrapped to the size of your book. Fits in your mailbox so a pleasant surprise (if you don’t count the days) when you open it up and see it there. Book Depository – You can see above. A padded envelope! It was well protected and fit in my box. Pro point? You can play with squishy bubble wrap of the padded envelope once you’re done tearing it up in an attempt to get your book as fast as possible out of it. All three companies don’t have dodgy packaging techniques so your books will be in pretty good condition when you get them. NOW, let’s get on with the pricing! Why did I use BD this time? Well, firstly you’ve got to know I had checked the book out once I learned it was uh out. My first step would be to check Kinokuniya’s book web catalogue. They didn’t have it yet even if they have the first few books in the series. No point in checking out Popular and Borders doesn’t have an online book search which is stupid really. If Kino didn’t have it yet (and they can be slow to stock some titles), it’s off to the online stores instead! Amazon and Borders are out in my list because of their shipping costs so whatever. This post is for my favourite online stores instead. 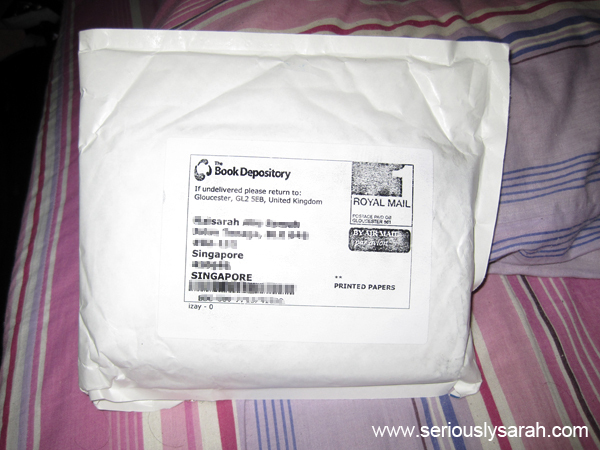 Open Trolley, Acma Mall and Book Depository. Acma Mall – $12.32 with free shipping. At the time of this post, they’ve got a new deal where you’ll get your book within 7 working days. Book Depository – $11.38 with free shipping. Open Trolley – $12.91, shipping = $4.98 (per order, not book) or book costs $11.62 if using DBS/POSB card or for non users of those banks, you’d get that cheaper price if you buy at least 2 books. Free “shipping” if you pick up at Toy Outpost instead. You can see BD won this time. However, I don’t stick to each particular store every time because it depends on the books. Acma Mall has popular titles but for some obscure ones, Open Trolley has it and Book Depository too. The best time to go to Open Trolley is when they have sales going on where it sometimes can be 20% discount or more depending on the months. THEN you get your friends and go insane on the books. Get shipping if you’re feeling lazy since it’s just per order and not per book. It’s like the price of 2 long bus trips anyway. Also when I mean their range of books is large, it is really large. For those obscure titles and comics, you can find it here mostly. If you can’t find a book you want, email them and they can try hunt it down for you, it’s in their services. Meanwhile, Acma Mall has their own discounts too where you get codes from some book councils places and it’s faster than the brick and mortar stores here with new releases. The downside is their search engine on their website. Sometimes you get errors so you’ll just have refresh or key in a different key word like the author name instead of the book title. They’re on twitter too and come out with promotions now and then. Quick to response to customer feedback etc so you don’t need to freak out if something happens to your package or something and need to email them etc. Oh and they sell more than just books too. Book Depository is woah on the range and the price. Just remember that it’s from the UK and while the shipping time is around 10 days or so for us at the minimum, there might be delays due to unexpected volcanoes/strikes/bad weather/etc. Things do happen after all. I’m having a lack to say here because it pretty much an ideal store too! They don’t have promos from what I see though since they’re already providing free shipping and cheap book rates. If you buy a lot of books, they won’t come in one package, instead the books come individually via mail. It’s weird but they mail it to you one by one. For each of the stores, it’s best to just see when you’re buying the book. 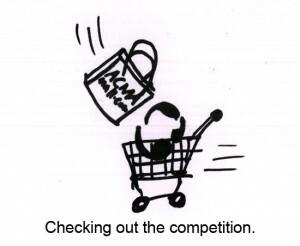 Also, this is a new Book SG price comparison site by Brian Ellison. You might like to have it a go if you don’t want to do that much work of comparing yourself. It’s new at the moment of this post so it might have a lack of data for now. So any more online book stores you’ve tried out besides these three that I’ve used? Heh, it IS good that we can get a variety of stores when one runs out! We’ll have to try them out from the publisher’s perspective, as in whether or not a publisher can make money selling through them. Amazon just costs money to sell through and their invoicing and payment system is so labourious. We tried contacting Acma but no response. That was a while ago so maybe they have improved. I tried open trolley and book depository for the 1st time last week. I had always buy my books from local bookstore until my friend recommended buying online because they are alot more cheaper. 1st time encounter with OT was abit unpleasant. So far, BD was good. I ordered 2 books from OT and 8 books from BD in the same day. 1 of my BD book came very fast. then next came the 2nd one not long after. BD dispatched different books at different timing. I did not expect to get my books so fast. I chose to self collect at Toy outpost for my OT books. When i received 1 of the book, i was so disappointed as to see that it is not what i saw as displayed on the website. I bought that book because of the cover page and now i get a different one. It is kind of misleading. customers should get the actual/exact of what is being shown on the website. I felt abit cheated. I had sent them an email to request for exchange and waiting to see how they respond. 2 weeks and 2 emails to them (open trolley) on what i should do about my book. And not even a reply from them. what a “good” service they offer. Never going to buy form them again. My 8 books from BD comes perfectly! Sent another email to OT again. no reply from them at all, such a poor customer service. my book had been resting there for 3rd week already. Maybe i should consider bring up to CASE. That is so sad. They used to be really fast for me back THEN. Perhaps now after their upgrades and overhaul, they have different staff etc. Hope you’ll get an answer from them somehow. Or try their phone in case your email went to junk or something. Their details are on their contacts page anyway. The best online option to buy books in Singapore? They have a limited online catalogue, and shipping is FREE in Singapore. 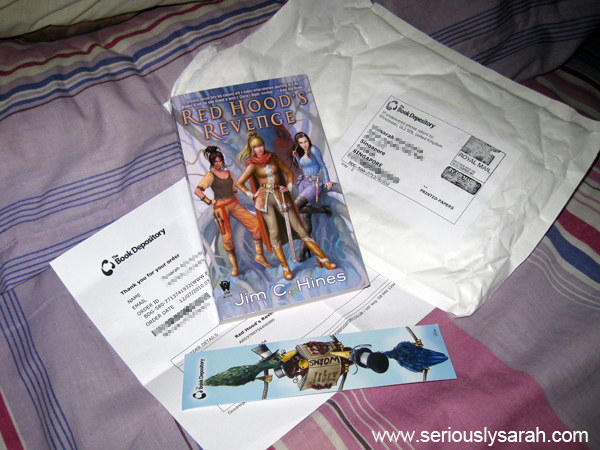 Couldn’t believe it, so I ordered – got my books in THREE DAYS! Plus, they’re cheaper than BD, OT, etc etc. The only thing is that they don’t carry the super popular books, and if you want to place a special order, it takes about 2 weeks to arrive. Oooh, this is new! I’m gonna check it out. I have been buying books from Opentrolley for the past 1 year. Have been quite happy with their prices, selection and self-collection process. However, i was just wondering if it’s just me or does anyone else feel their MMP book covers seem thinner compared to MMPs from Kino/Borders etc. It just seems more ‘fragile’ when i leave an OT MMP in my bag, compared to a Kino/Borders MMP. I dont mind so much when buying book/series by new authors, but i’m hesitant to use OT for some of my fav/long-awaited releases. I don’t know… The books are actually the same to me, weird because in the end, it’s all from the main publishing source. one more month had passed and i already returned the book to them and $ not yet refunded to me. such a poor service again. i will never ever try a s’pore website to buy books again. lucky that book is only $20+. I won’t buy from Open Trolley ever again! Lousy customer service. They notified that my order was dispatched, but I did not receive anything. When the reply came, it was just an email, giving me a tracking number, and website. My god! How rude! I just received the 3 books I ordered, and guess what… the book was printed “Special Price, Only US$4.99”, and OT’s price is S$10.16!!! Oh maaan, I never bought that many books before from one source but now I see if it has no tracking number and all that, that WOULD be very troublesome. Anyone tried http://www.thegroovygiraffe.com? Saw good reviews on their facebook and pricing is preety good, some are over 80% off! ?